Back by popular demand, “The World’s Greatest County Fair Food” Contest returns for its second year at the Clay County Fair, September 9-17. Out of 31 new foods at the Fair this year, the contestants have been narrowed down to five finalists. Waffle Chix (Waffle Chix) is a chicken tender skewered on a stick, baked inside of a waffle. Thanksgiving Balls (Eat It) are a combination of an abundance of traditional vegetables (carrots, potatoes, corn, celery and sweet potatoes) with Iowa grown turkey – all rolled into a ball, breaded with an herb infused stuffing, deep-fried and drizzled with their homemade sweet ‘n spicy cranberry sauce. Cookie Dough Kabobs (Dough Boys) are made with safe to eat cookie dough. Hot Tenderloin Sandwich (Terry Town Enterprises) includes diced breaded tenderloin on bread with mashed potatoes smothered in pork gravy. Breakfast Quesadillas (Regals Concessions) are made with sausage/egg, bacon/egg, steak/egg, or cheese/egg. The winner will be announced at the contest judging, which will be held on Saturday, Sept. 9 at 2 p.m. in Central Park. 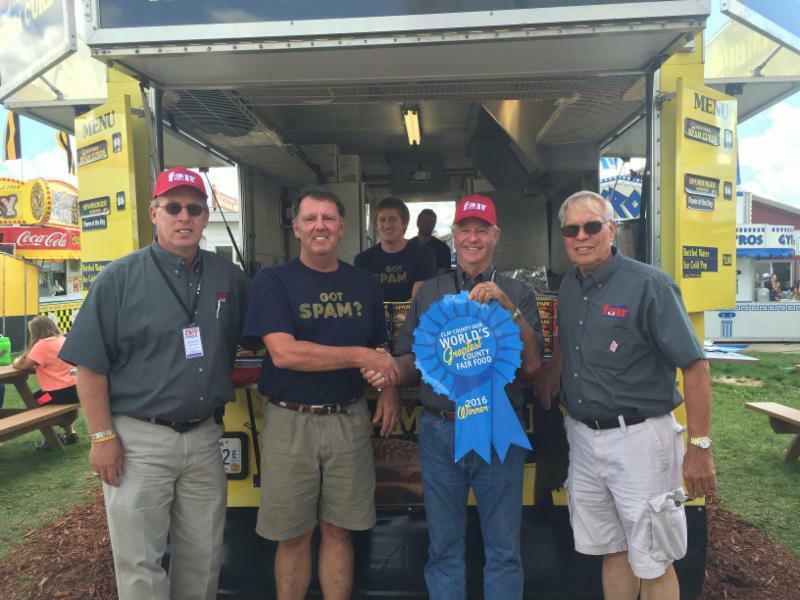 The 2016 winners of the “World’s Greatest County Fair Food” Contest, Spam Curds.